Measured by the number of islands, Turku Archipelago, with its 40,000 or so islands and islets, is among the world’s largest. The southwest corner of Finland is a veritable treasure chest for the visitor. Let yourself be captivated by the eye-pleasing archipelago scenery, the peacefulness of the countryside, the relaxing impact of the nature activities or the cultural heritage of the region. 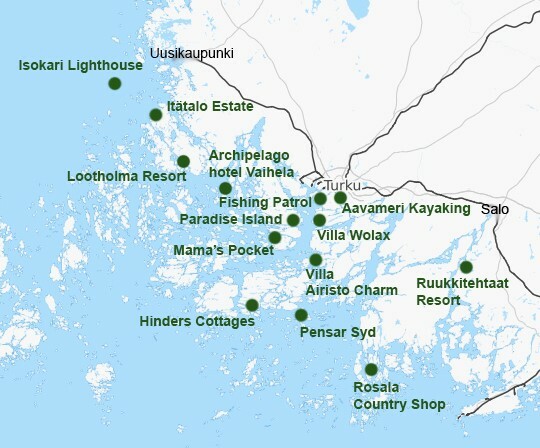 Would you like to enjoy the fresh sea breeze and nature activities near Turku as close to the sea you can? Or take your family, group of friends or company e.g. on a sail race in the archipelago sea from Villa Wolax? Or would you like to let the experienced fishing guide of Fishing Patrol show you the best places to fish a pike? Or explore the islands with rich flora & fauna with the kayaks guided by Aavameri guides? Or would you just like to relax? 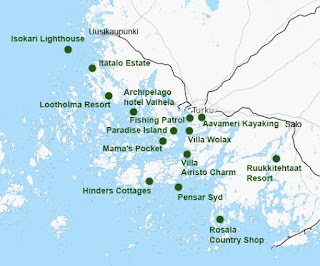 Perhaps take a cruise at leisure to admire the scenery with rocky islands, and after that to enjoy the authentic Finnish sauna, delicious local dishes and accommodation in archipelago surroundings offered by Paradise Island, Mama’s Pocket or Archipelago Hotel Vaihela? Maybe you are looking for a luxury venue for a private party or meeting? In that case Villa Airisto Charm with a fantastic sea view is your choice! If you are willing to get a deeper insight into the giant archipelago, take for example a one week holiday and visit three heritage gems at one go. Begin with the old, picturesque iron works village of Mathildedal at the edge of the Teijo National Park which has a varied sea, lake and bog landscape. Ruukintehtaat Resort offers you with food, accommodation and many activities. Travel with the ferryboat to the Island of Pensar Syd and enjoy the tranquility of the nature by lodging in an own villa by the sea. Crown your holiday with the fascinating Isokari Island in the Bothnian Sea National Park, where the old lighthouse rises 50 meters above the sea level offering a breathtaking view in all directions. If you have the possibility for a longer holiday, take an excursion from Mathildedal to Taalintehdas, yet another old iron works village by the sea, the location of a nice country shop of Rosala Handelsbod, While in Pensar Syd you can combine visiting the charming Nauvo village with a bustling guest harbor and stay a couple of nights in a traditional Finnish summer cottage at Hinders some kilometers away. On the way out to Isokari Lighthouse Island stop by in Kustavi, a nice archipelago municipality. Lootholma Resort offers accommodation and activities for the whole family, and the traditional farm house milieu of Itätalo Estate about 10 kilometers from the Kustavi center is the place to de-stress your mind.